We have multiple positions available for Christmas Central this year including intake volunteers as well as host/hostess position. The location for this to be announced, volunteers will be working with Chilliwack Low income residents that are in need of a Christmas Hamper. You can work a 2 hour shift or a full day if you prefer! Christmas Central opens November 13 and will close December 14. The hours are 10am to 12pm and 1:00pm to 3:00pm, Monday Through Saturday. We need a few volunteers that are able and willing to pick up food from all of the grocery stores in Chilliwack a few days per week. Typically you use your own vehicle, however we can arrange for our cargo van if needed. This will be a commitment of 1 time or more a week for a few hours per day. 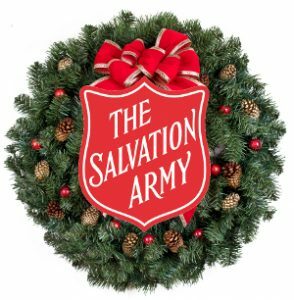 The Salvation Army is known around the world for the red kettles, you can be a part of this worthwhile cause. We require volunteers to work 2 hour shifts collecting donations on behalf of The Salvation Army. If you would like to volunteer for our Kettle Campaign I will put you in touch with our kettle coordinator. Kettles Start November 17 and will be going strong until December 24, 2018. Kettle times are 10am to 8:45pm Monday-Friday and 10 am to 6pm on Saturdays, in 2 hour shift increments. The Christmas Expo comes to town and December 7 from 3:30-8:00pm, December 8 and 9th are from 9:30am-3:00pm. Shred a thon-At cottonwood mall parking lot 10am-2pm and they are 2 hour shifts. Volunteers are needed for a variety of roles including checking in our clients, preparing hampers, paperwork, kitchen helpers, lifters, delivery drivers, greeters and a variety of other volunteer roles. Client Greeters, Reception hamper distribution, assisting clients with hampers, lifting, organizing hampers and a variety of other tasks. We are in need of volunteers on December 22 to assist the car dealerships volunteers in collecting food from all of the schools that have signed up to do the food drives. Volunteers are needed from 9 am to 3pm and will have lunch in between. If you can help for the whole day that’s great, if not you could work a morning or afternoon.